Oncor wants to get some home energy monitors in the field to see how they work and get customer feedback. There are a limited number available, so you would need to act fast to have a chance at one. There are a couple of qualifications, of course. Second, you must have an active smart meter. These are the new meters that Oncor has been deploying, you should have received a door hanger when you had your meter changed out, and the meter must be active. 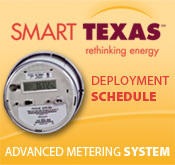 You can check on the Smart Meter Texas website to see if your meter is active. “Act Now! You may be eligible to receive a free in-home energy monitor! 1. You must have an active smart meter. You may verify this by logging on to the Texas smart meter web portal at www.smartmetertexas.com and sign up to view your energy usage. which can be found on your electric bill, email address and the address for us to mail the device. This is a limited offer so if you have a new smart meter and are interested in you real time energy consumption here is an opportunity to get a free in-home display and participate in the initial roll out of this new program to help save energy.